The award-winning duo behind the animal adventure picture books No Bears and Once upon a Small Rhinoceros are back with a new book that tells the story of young sleep-deprived Amos, a boy who begins counting sheep one night. In a plot twist that resembles a Monty Python sketch, two charismatic sheep, Walter and Felix (not ‘One’ and ‘Two’, thank you very much), tumble from Amos’ dream into his bedroom. They live here until an officially approved fence between Amos’ reality and his subconscious is constructed. And, they arrive with a caveat: there’s a proper way to do things. Meg McKinlay and Leila Rudge are an ideal pairing: the lightness of tone and tongue-in-cheek nature of McKinlay’s words goes hand in hand with Rudge’s detailed yet uncluttered coloured pencil work. Let Me Sleep, Sheep keeps its audience reading until the end by using a healthy dose of surrealism alongside conversational humour to subvert expectations. 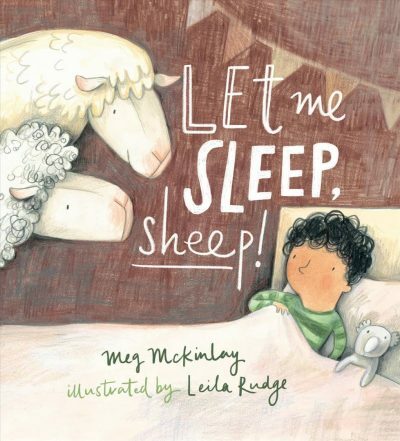 A whimsical picture book perfect for children aged from four through to primary-school age, this book puts the ‘baa’ into bedtime.